Four Seasons Hotel Singapore combines timeless luxury with modern convenience in one of the world’s most cosmopolitan cities. 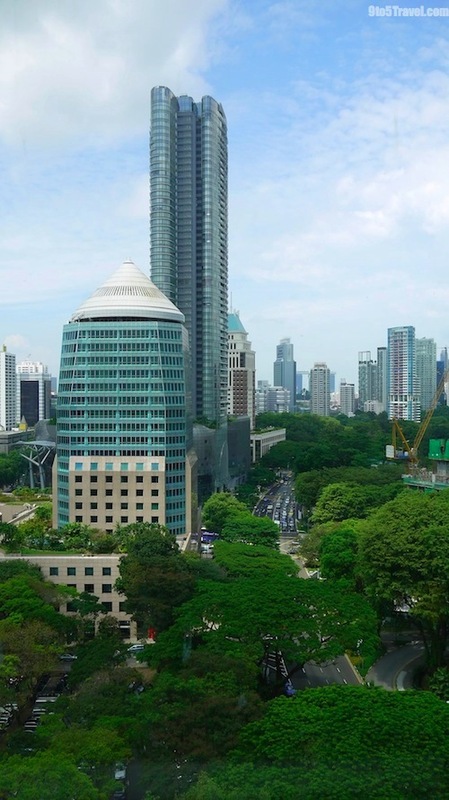 Nestled in a contemporary twenty storey building along the lush, tree-lined Orchard Boulevard, the 255-room five-star hotel is just minutes from Singapore’s top boutiques and world-class attractions. 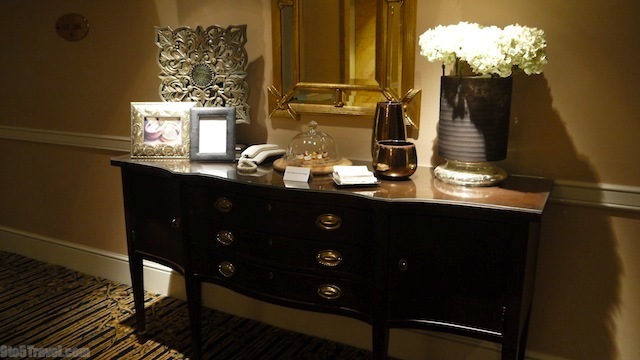 Upon our arrival, warm and welcoming staff demonstrated the utmost in professionalism while making check-in a breeze. We were then treated to a refreshing welcome drink in One-Ninety restaurant, where we also enjoyed a superb breakfast the following morning. Specifically designed for couples, Four Seasons Hotel Singapore’s adults-only 11th floor is a relaxed, intimate sanctuary. We stepped off the elevator and were treated to canapés (replenished throughout the day, so they’re always fresh) on the lift landing. Hallway lighting on this special floor changes morning, afternoon and evening to create a romantic atmosphere. We escaped together in our Deluxe Room with romantic music and movies from their Concierge selection. The king-sized bed was absolutely glorious. Its incredibly comfy pillow-top mattress enveloped us like a cocoon, and we were able to sleep-in without any disturbance because housekeeping does not come by before noon on the couples’ floor, unless otherwise requested. Our comfortable sitting area with armchair and ottoman had a fantastic selection of luxe lifestyle magazines. Below the batik paperweight on the tray was a pillow menu that included hypoallergenic, orthopedic or down pillows upon request. And along with a fully stocked private bar, fragrant loose leaf tea with Fiji Water were offered. 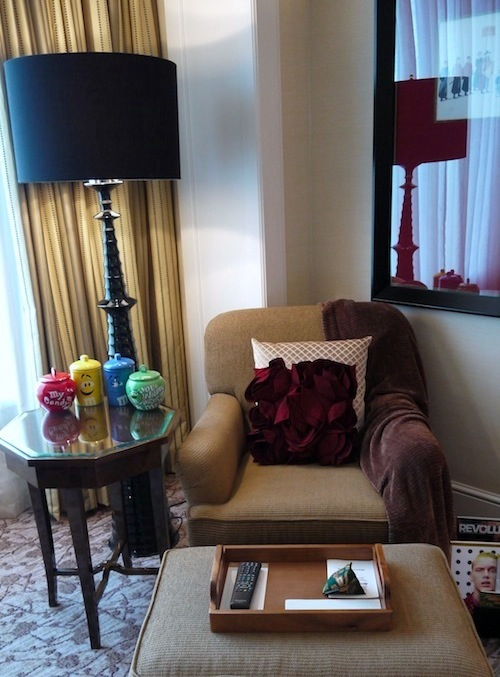 The mood was sweetened with complimentary in-room candies and sweets as M&M’s, marshmallows, shortbread cookies, and Jelly Belly beans were filled in colourful ceramic containers. 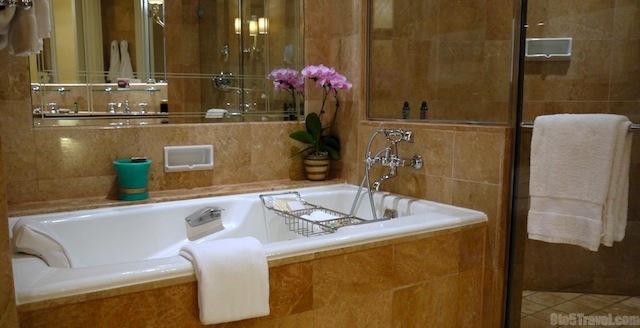 Our large marble bathroom included a deep soaker tub for a relaxing candle-lit bath showcased in the Bath Butler Menu. The restroom had a separate rainshower stall, and a water closet with bidet were in another alcove. His and hers sinks were complete with quality toiletries from French natural body care company, L’Occitane. Plush his and hers bathrobes and cozy slippers in small and large sizes, perfect for couples. A separate vanity right outside of the bathroom had a beautiful jewelery box so I had a convenient place to store my rings and necklaces. Here’s the lovely view of Singapore from our couples’ room. Notice famous Orchard Road on the left with the visible entrance to ION Orchard. 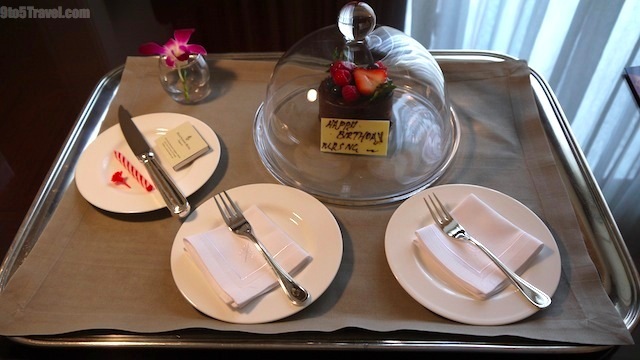 A delightful surprise was waiting for us in our room along with a handwritten card welcoming my husband and I to the impressive hotel. A plate of fresh berry fondue held crisp, immaculately pressed napkins with Four Seasons logos. It’s truly all in the details at this luxury property. Another treat waiting for us was a decadent chocolate birthday cake. 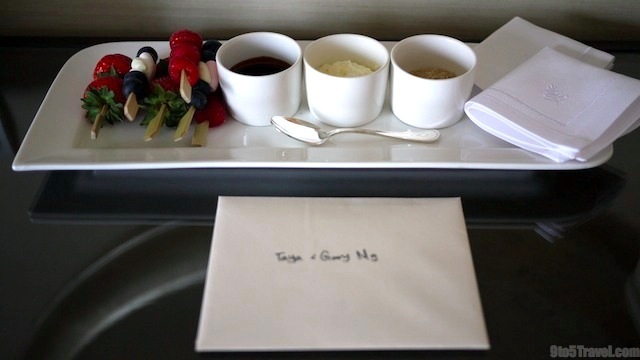 Served on a silver platter, they really treat their guests like royalty at the Four Seasons. Our good friends Tom & Elaine from Suma Lifestyle joined us in the evening for champagne and delicious cake to celebrate a perfect birthday. Anticipating our needs, front desk rang our room to see if we required transportation upon check-out and to collect our bags. When we appeared in the lobby, bellmen ushered us into the waiting taxi like VIPs while the doorman directed the driver where to take us. It was a sad departure as this hotel is so special that I did not want to leave. 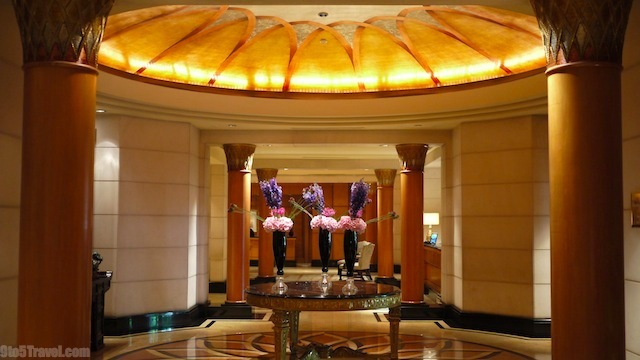 Four Seasons Singapore clearly exemplified their dedication to perfecting the travel experience. Their impeccable, highly personalized 24-hour service with unrivaled depth of reliability and attention to detail, combined with elegant surroundings of the highest quality, embodies a home away from home. 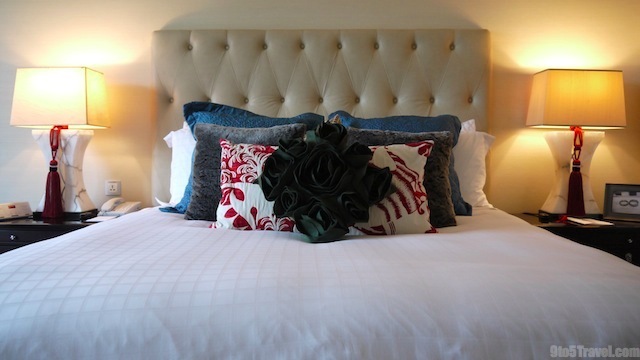 Coupled with exquisite cuisine and first-class facilities made this hotel have no faults in our eyes. We’d have to say this was the most well-rounded hotel we’ve ever stayed in. This is coming from a couple who’ve worked at 5-star properties and stayed at plenty of luxury hotels around the world. We know what standards to anticipate and the Four Seasons exceeded our expectations. We’re certainly looking forward to returning to the Four Seasons Singapore in the future and can’t wait to visit more of the ninety Four Seasons properties around the globe. Want to learn more about this exceptional hotel? Click here to discover all of the hotel facilities. You can also click here to see its luxurious suites, and click here to explore the hotel’s multiple dining options. 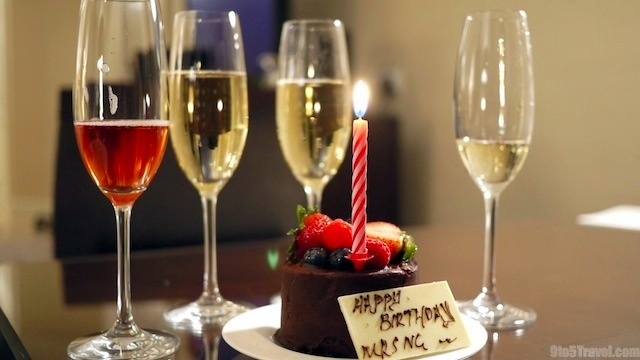 A warm thank you to Michelle Wan of Four Seasons Singapore for our unforgettable stay!